Reasonable activity of an alien civilization showed up unexpectedly close to us. However, we were not psychologically ready for it. We still come across publications trying to find an answer to the following question: Are we alone in the universe? At the same time, the presence of reasoning beings has been detected close to our home, on the Moon. However, this discovery was immediately classified as secret, as it is so incredible that it even might shake the already existing social principles, reports Russia's newspaper Vecherny Volgograd. The scientists spoke rather cautiously and evasively about these objects, with the exception of an UFO. They always mentioned that the man-made objects are possible, and stated the information was still under study and official results will be published later. 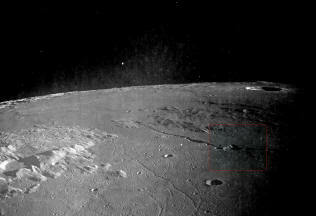 It was mentioned at the briefing as well that the Soviet Union used to own some photo materials proving the presence of such activity on the Moon. 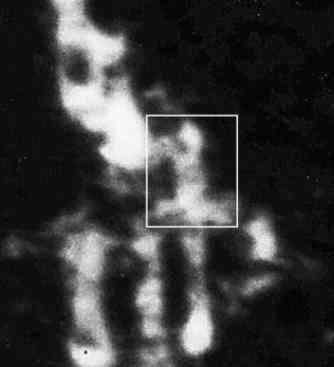 And, although it wasn’t identified what kind of activity it was, thousands of photo and video materials from the Apollos and the Clementine space station showed many parts on the lunar surface where this activity and its traces were perfectly evident. The video films and photos made by US astronauts during the Apollo program were demonstrated at the briefing. People were extremely surprised why the materials hadn’t been presented to the public earlier. Specialist for lunar studies Richard Hoagland says that NASA is still trying to alter photo materials before they are published in public catalogues and files. They do some retouching or are partially refocussing them while copying. Some investigators, Hoagland is among them, suppose that an extraterrestrial race had used the Moon as a terminal station during their activity on the Earth. These suggestions are confirmed by the legends and myths of different nations of our planet. The ruins of lunar cities stretch for many kilometers. Huge domes on massive basements, numerous tunnels, and other constructions cause scientists to reconsider their opinions concerning the Moon. How the Moon appeared and principles of its revolving around the Earth still pose a great problem for scientists. 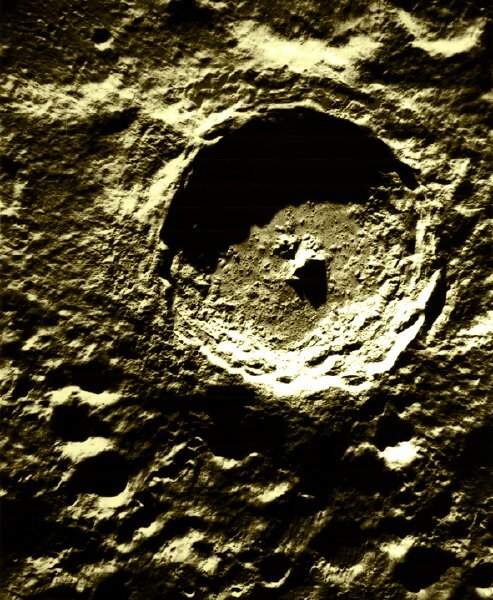 Some partially destroyed objects on the lunar surface can’t be placed among natural geological formations, as they are of complex organization and geometrical structure. 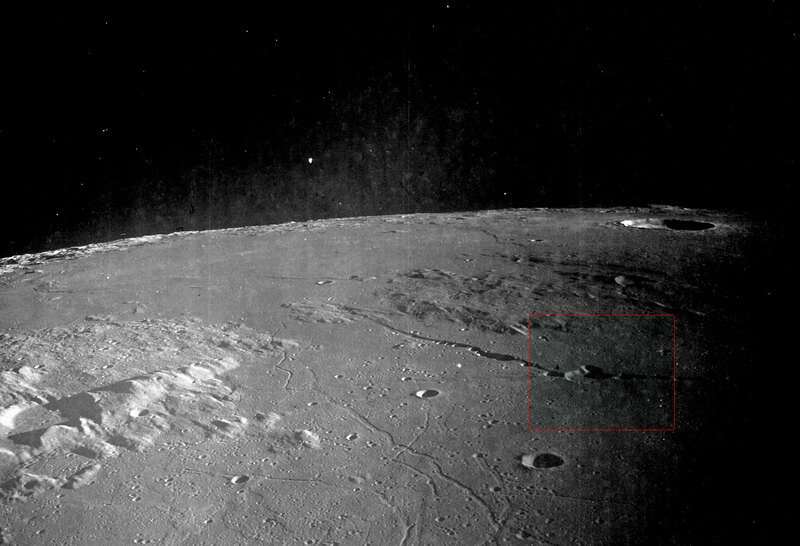 In the upper part of Rima Hadley, not far from the place where the Apollo-15 had landed, a construction surrounded by a tall D-shaped wall was discovered. As of now, different artifacts have been discovered in 44 regions. The NASA Goddard Space Flight Center and the Houston Planetary Institute are investigating the regions. Mysterious terrace-shaped excavations of rock have been discovered near the Tycho crater. The concentric hexahedral excavations and the tunnel entry on the terrace side can’t be the results of natural geological processes; instead, they look very much like open cast mines. 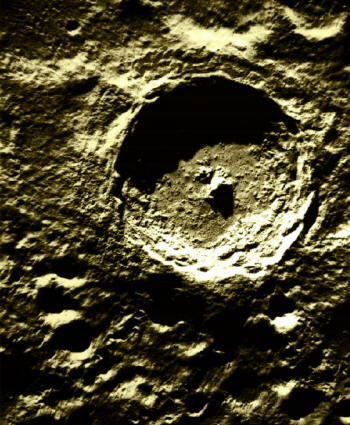 A transparent dome raised above the crater edge was discovered near the crater Copernicus. The dome is unusual, as it is glows white and blue from the inside. A rather unusual object, which is unusual indeed even for the Moon, was discovered in the upper part of the Factory area. A disk of about 50 meters in diameter stands on a square basement surrounded with walls. In the picture, close to the rhomb, we can also see a dark, round embrasure in the ground, which resembles an entry to an underground caponier. There is a rectangular area between factory and the crater Copernicus, which is 300 meters wide 400 meters long. 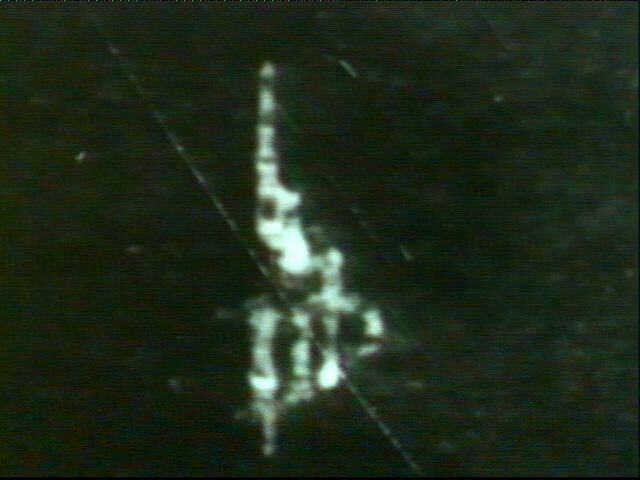 Apollo-10 astronauts took a photo (AS10-32-4822 below) of a one-mile long object called "Castle," which is at the height of 14 kilometers and casts a distinct shadow on the lunar surface. (Right) Current image AS10-32-4822 as stored in the NASA web-archive. The object seems to consist of several cylindrical units and a large conjunctive unit. The internal porous structure of the Castle is clearly seen in one of the pictures, which gives the impression that some parts of the object are transparent. As it turned out at the briefing where many NASA scientists were present, when Richard Hoagland had requested originals of the Castle pictures (below images) for the second time, no pictures were found at all. They disappeared even from the list of pictures made by the Apollo-10 crew. 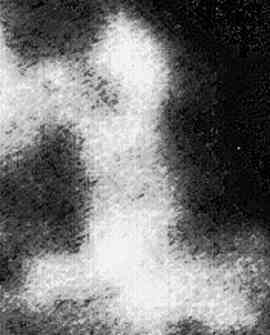 Only intermediate pictures of the object were found in the archives, which unfortunately don’t depict the internal structure of the object. When the Apollo-12 crew landed on the lunar surface, they saw that the landing was observed by a half-transparent, pyramidal object. It was hovering just several meters above the lunar surface and shimmered with all the colors of the rainbow against the black sky. In 1969, when the film about astronauts traveling to the Sea of Storms was demonstrated (the astronauts saw the strange objects once again, which were later called “striped glasses”), NASA finally understood what consequences such kind of control could bring. 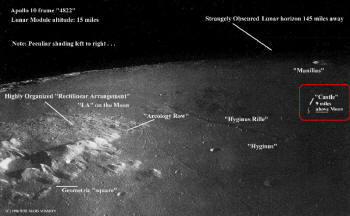 Johnston, who worked at the Houston Space Center and studied photos and video materials made during the Apollo program, discussed the artifacts with Richard Hoagland and said that the NASA leadership was awfully annoyed with the great number of anomalous, to put it mildly, objects on the Moon. It was even said that piloted flights to the Moon might be banned. Investigators are especially interested in ancient structures resembling partially destroyed cities. Photos reveal an astonishingly regular geometry of square and rectangular constructions. They resemble our cities seen from the height of 5-8 kilometers. 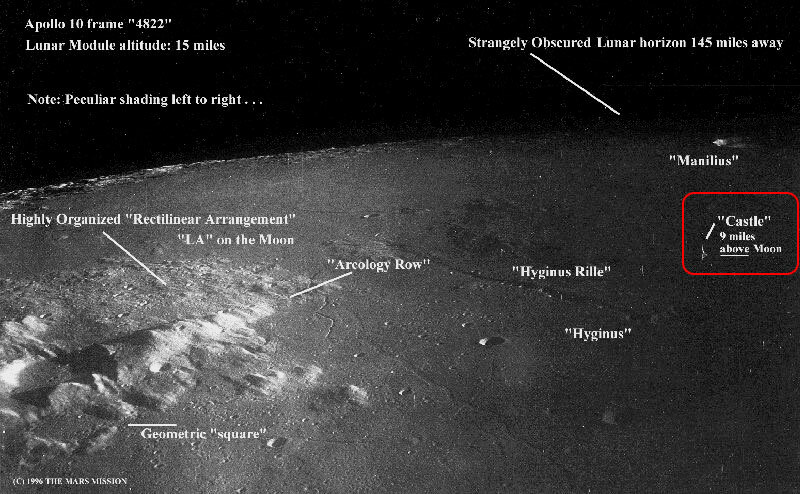 What do geologists and scientists say after studying the pictures of lunar cities and other anomalous objects? They say that such objects can’t be natural formations. Reasonable activity of an alien civilization showed up unexpectedly close to us. We were not ready for it psychologically, and some people hardly believe they are true even now.